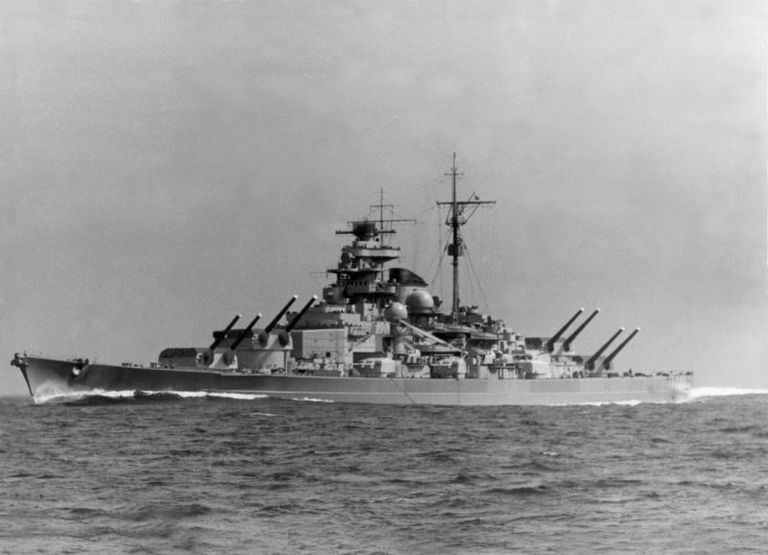 The Tirpitz was a German battleship used during World War II. The British made several efforts to sink Tirpitz and finally succeeded in late 1944. Length: 823 ft., 6 in. Beam: 118 ft. 1 in. Laid down at Kriegsmarinewerft, Wilhelmshaven on November 2, 1936, Tirpitz was the second and final ship of the Bismarck-class of battleship. Initially given the contract name "G," the ship was later named for famed German naval leader Admiral Alfred von Tirpitz. Christened by the late admiral's daughter, Tirpitz was launched April 1, 1939. Work continued on the battleship through 1940. As World War II had begun, the ship's completion was delayed by British air strikes on the Wilhelmshaven shipyards. Commissioned on February 25, 1941, Tirpitz departed for its sea trials in the Baltic. Capable of 29 knots, Tirpitz's primary armament consisted of eight 15" guns mounted in four dual turrets. These were supplemented by a secondary battery of twelve 5.9" guns. In addition, it mounted a variety of light anti-aircraft guns, which were increased throughout the war. Protected by a main belt of armor that was 13" thick, Tirpitz's power was provided by three Brown, Boveri & Cie geared steam turbines capable of producing over 163,000 horsepower. Entering active service with the Kriegsmarine, Tirpitz conducted extensive training exercises in the Baltic. Assigned to Kiel, Tirpitz was in port when Germany invaded the Soviet Union in June 1941. Putting to sea, it became the flagship of Admiral Otto Ciliax's Baltic Fleet. Cruising off the Aland Islands with the heavy cruiser, four light cruisers, and several destroyers, Ciliax endeavored to prevent a breakout of the Soviet fleet from Leningrad. When the fleet disbanded in late September, Tirpitz resumed training activities. In November, Admiral Erich Raeder, commander of the Kriegsmarine, ordered the battleship to Norway so that it could strike at Allied convoys. After a brief overhaul, Tirpitz sailed north on January 14, 1942, under the command of Captain Karl Topp. Arriving at Trondheim, the battleship soon moved to a safe anchorage at nearby Fættenfjord. Here Tirpitz was anchored next to a cliff to aid in protecting it from air strikes. In addition, extensive anti-aircraft defenses were constructed, as well as torpedo nets and protective booms. Though efforts were made to camouflage the ship, the British were aware of its presence through decrypted Enigma radio intercepts. Having established a base in Norway, Tirpitz's operations were limited due to fuel shortages. Though Bismarck had some success in the Atlantic against HMS Hood prior to its loss in 1941, Adolf Hitler refused to allow Tirpitz to conduct a similar sortie as he did not wish to lose the battleship. By remaining operational, it served as a "fleet in being" and tied down British naval resources. As a result, ​Tirpitz's missions were largely limited to the North Sea and Norwegian waters. Initial operations against Allied convoys were canceled when Tirpitz's supporting destroyers were withdrawn. Putting to sea on March 5, Tirpitz sought to attack Convoys QP-8 and PQ-12. Missing the former, Tirpitz's spotter aircraft located the latter. Moving to intercept, Ciliax was initially unaware that the convoy was supported by elements of Admiral John Tovey's Home Fleet. Turning for home, Tirpitz was unsuccessfully attacked by British carrier planes on March 9. In late June, Tirpitz and several German warships sortied as part of Operation Rösselsprung. Intended as an attack on Convoy PQ-17, the fleet turned back after receiving reports that they had been spotted. Returning to Norway, Tirpitz anchored in Altafjord. After being shifted to Bogenfjord near Narvik, the battleship sailed for Fættenfjord where it began an extensive overhaul in October. Concerned over the threat posed by Tirpitz, the Royal Navy attempted to attack the ship with two Chariot human torpedoes in October 1942. This effort was disrupted by heavy seas. Completing its post-overhaul trials, Tirpitz returned to active duty with Captain Hans Meyer taking command on February 21, 1943. That September, Admiral Karl Doenitz, now leading the Kriegsmarine, ordered Tirpitz and other German ships to attack the small Allied base at Spitsbergen. Attacking on September 8, Tirpitz, in its only offensive action, provided naval gunfire support to German forces going ashore. Destroying the base, the Germans withdrew and returned to Norway. Eager to eliminate Tirpitz, the Royal Navy initiated Operation Source later that month. This involved sending ten X-Craft midget submarines to Norway. The plan called for the X-Craft to penetrate the fjord and attach mines to the battleship's hull. Moving forward on September 22, two X-Craft successfully completed their mission. The mines detonated and caused extensive damage to the ship and its machinery. Though badly wounded, Tirpitz remained afloat and repairs commenced. These were completed on April 2, 1944 and sea trials were planned for the following day in Altafjord. Learning that Tirpitz was nearly operational, the Royal Navy launched Operation Tungsten on April 3. This saw eighty British carrier planes attack the battleship in two waves. Scoring fifteen bomb hits, the aircraft inflicted serious damage and widespread fires but failed to sink Tirpitz. Assessing the damage, Doenitz ordered the ship repaired though understood that, due to a lack of air cover, its usefulness would be limited. In an effort to finish the job, the Royal Navy planned several additional strikes through April and May but were prevented from flying due to poor weather. By June 2, German repair parties had restored engine power and gunnery trials were possible at the end of the month. Returning on August 22, aircraft from British carriers launched two raids against Tirpitz but failed to score any hits. Two days later, a third strike managed two hits but inflicted little damage. As the Fleet Air Arm had been unsuccessful in eliminating Tirpitz, the mission was given to the Royal Air Force. Using Avro Lancaster heavy bombers carrying massive "Tallboy" bombs, No. 5 Group conducted Operation Paravane on September 15. Flying from forward bases in Russia, they succeeded in getting one hit on the battleship which severely damaged its bow as well as injured other equipment on board. British bombers returned on October 29 but managed only near misses which damaged the ship's port rudder. To protect Tirpitz, a sand bank was built around the ship to prevent capsizing and torpedo nets were put in place. On November 12, Lancasters dropped 29 Tallboys on the anchorage, scoring two hits and several near misses. Those that missed destroyed the sand bank. While one Tallboy penetrated forward, it failed to explode. The other struck amidships and blew out part of the ship's bottom and side. Listing severely, Tirpitz was soon rocked by a massive explosion as one of its magazines detonated. Rolling, the stricken ship capsized. In the attack, the crew suffered around 1,000 casualties. The wreck of Tirpitz remained in place for the remainder of the war and was later salvaged between 1948 and 1957.